Two years have passed since 8/11. But this is not the first time that India's currency of the time faced the axe. The Mughals, after invading a territory, would effect the demonetisation of the local currency with the aim to cripple the economy of the land. Prakash Bhandari flips through the pages of history to the times when currency was declared defunct overnight. The Indian rupee, which draws its name from the Sanskrit word rupyakam, has been at the centre of many discussions and debates following the demonetisation of high value currency notes on November 8. But this is not the first time that India's currency of the time has faced the axe. The Mughals, after invading a territory, would effect the demonetisation of the local currency with the aim to cripple the economy of the land, says art historian Chandramani Singh. They would then exchange the previous ruler's coins invariably for a lower value to ensure that the local people became dependent on them and toed their line. Akbar's army, led by his general, Raja Man Singh of Amber, was ordered to seize all the local coins after conquering a territory. In their place, coins from Akbar's mints would be issued. So, Akbar was instrumental in starting 'sikkabandi'. Akbar liked the coins that were prevalent during his forerunner Sher Shah Suri's reign and issued gold, silver and copper coins on those patterns, even adopting their weight and fabric. But, quite like today, he too faced the problem of counterfeit currency, especially from rulers in the southern parts of India who would issue fake coins resembling those from Akbar's mint. To counter this problem, Akbar would often change the weight and form of his gold coins and the inscriptions on them. He was also the first to issue coins of Rs 10, Rs 12 and Rs 20 as well as fractional coins. After his death, his son Jahangir inherited the throne. Born to a Hindu mother, Jodha Bai (the princess of Amber), Jahangir issued gold and silver coins that had Hindu zodiacal signs like Mesh (Aries), Kark (Cancer), Tula (Libra), Makar (Capricorn) and so on. Later, as Jahangir's physical and mental powers began to fail him, he left the administration of the kingdom to his favourite wife, Nur Jahan, and, in his own words, contended himself by a seer of wine and a seer of kebab. (By the order of Jahangir, gold attained a hundred times its beauty when the name of Nur Jahan, the First Lady of the court, was impressed upon it). These coins did not find favour with Shah Jahan who became the emperor after Jahangir's death. He did not like the Hindu zodiacal signs on them and also the fact that they carried the name of Nur Jahan, whom he hated. "So, in 1630, in one of the cruelest forms of demonetisation, he ordered a ban on the use of these coins," says Triloki Das Khandelwal, an 86-year-old Jaipur-based coin collector. "He ruled that anybody found in possession of these coins would be given the death penalty." In sheer panic, people made a beeline for the emperor's revenue offices to get the coins replaced. In Khandelwal's collection are some of these coins that he bought 50 years ago for Rs 200. There is also a quarter anna copper coin that was issued by the Maharaja of Jodhpur in 1936 only to be demonetised 11 months later. The story goes that a constitutional crisis arose in the British empire in 1936 when King Edward VIII proposed to marry American socialite Wallis Simpson. Once divorced, she was now seeking a divorce from her second husband. The marriage was opposed by the British government as well as various legal, political and religious bodies. Simpson was perceived to be politically and socially unsuitable to be queen. The Church of England asked the king to choose between her and the crown. The king chose to abdicate the throne and marry Simpson. In Jodhpur, the maharaja had issued the quarter anna copper coins to commemorate the coronation of King Edward VIII. The viceroy of India now ordered him to withdraw them. The coins were still in circulation and the move to withdraw them came as a shock to the people of Jodhpur. "In the city, a drummer went around announcing in Marwari the withdrawal of the King Edward VIII marked coins," recounts Mandal Nath Joshi, a priest who was 12 when the demonetisation was effected in Jodhpur. The exchange was done at various revenue offices of the Jodhpur state. "People used to line up at these offices, just like they lined up outside banks and at ATMs." In Jodhpur, people faced problems for a few days as the shopkeepers would not accept the banned coins. 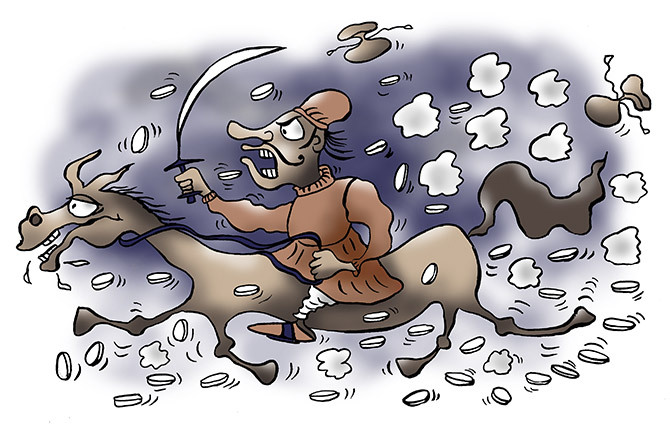 "But in the rural areas, it took time to make people believe that the coins could be withdrawn and it took months to get all the coins back from the desert state. Eventually, the coins were melted in the state mint." How well do you know D-Mart's Damani? Exit interview: What's next for Mudra Group CEO? When it comes down to man vs smart machine!